The great cycle of sports coverage revolves as surely and relentlessly as the spinning of the Earth. It can be hard to keep up with it all, which is why we use things like Kodi to gather it in one place. Whether you want to stream NFL on ESPN, kick back with the Golf Channel, see the latest games in the English Premier League, or watch live streams of the UFC and boxing, you can do it all here. 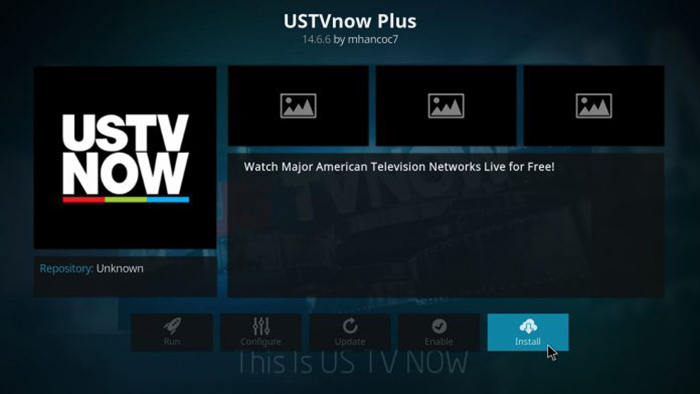 We’ll show you our favorite Kodi add-ons for sports and how to install them. With that in mind, let’s proceed! You don’t need to pay anything to get the basic NBC package with USTV Now, which will give you access to NBC as well as six other channels including Fox, ABC and CBS. Pay $19.99 however, and a world of sport opens up to you, with 29 channels including ESPN, ESPN 2 and NBC Sports, which will have you pretty well covered for NHL, NFL and much more. Note that if you already pay for NBC or ESPN with your cable subscription, you can log into their dedicated Kodi apps with your login details, so you wouldn’t need USTV Now to use them. One of the Three Kings of sports coverage in the US, Fox Sports Go is the place to go for all the biggies, including football, MLS soccer, MLB Baseball, UFC and NBA. It’s one of the most diverse, content-packed sports add-ons around, streaming in HD resolutions with minimal buffering. Being it’s a Fox add-on, you can expect a big archive of top sports coverage to peruse, too! 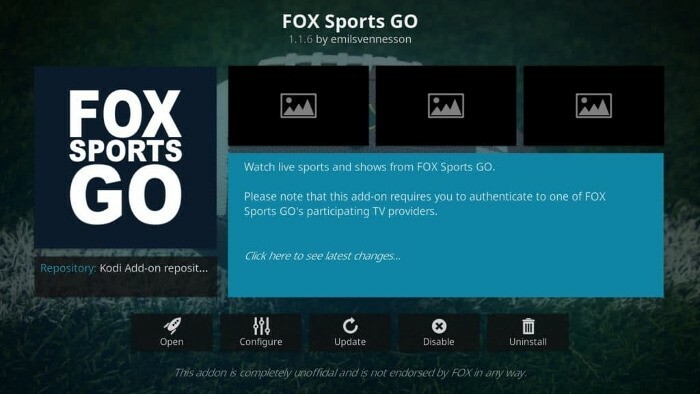 With the unofficial ESPN add-on for the Kodi media center, users can authenticate with their cable provider to access premium content directly from ESPN on Kodi. Additionally, there are options to select from content that ESPN makes available on modern, proprietary media center apps (Android TV, Apple TV, etc.). 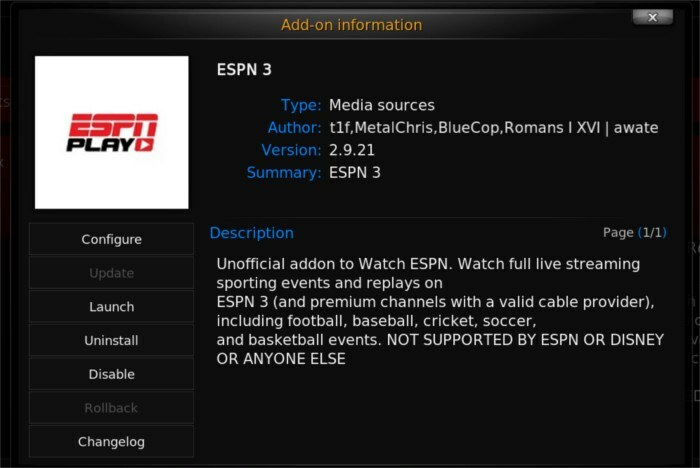 The ESPN 3 add-on is probably the biggest and most feature-rich of all the Kodi sports add-ons. Users can expect normal ESPN 3 sports streams, as well as archived content and premium sports-related content. 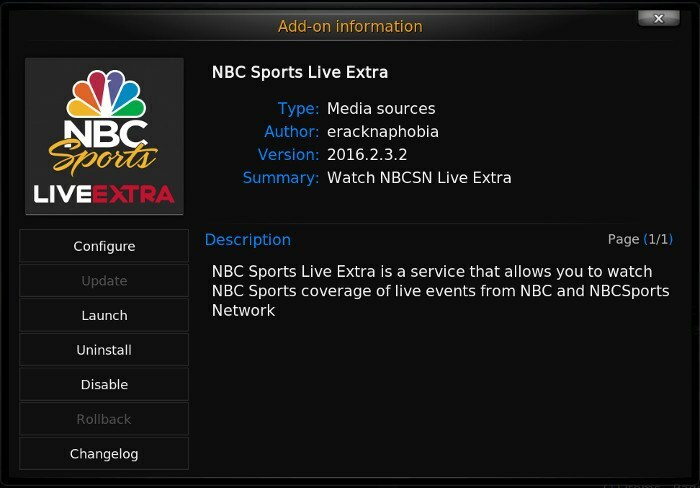 NBC Sports Live Extra is an add-on for Kodi that allows users to gain access to normal NBC network sports broadcasts of all kinds. This includes networks that are owned in some way by the network as a whole (such as The Golf Channel). Live channels include Golf, Racing, the Olympics, and even broadcasts of sport talk shows like NASCAR America and the like. Unfortunately, the NBC Sports Live Extra tool does not have the ability to play archived events, nor does it support archiving material in any way. Regardless, this tool is a very good addition to any sports fan’s media center. 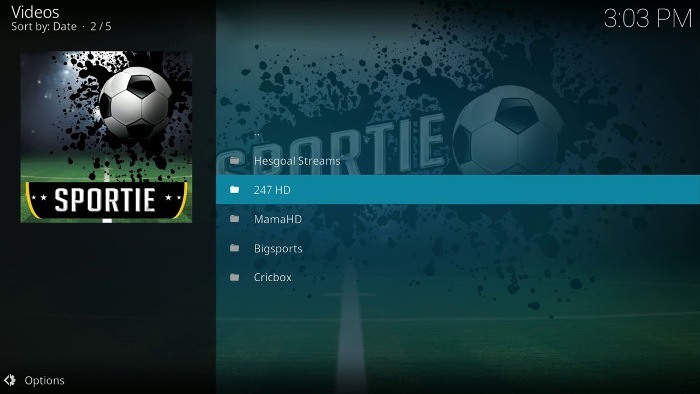 These add-ons are managed by communities of Kodi users and gather sports coverage from channels all over the world in one convenient place. They usually contain a broader variety of content than the official add-ons above, but be warned that not everything contained therein is legal. These sometimes pull coverage from subscription services, making it illegal for you to watch them. Furthermore, these add-ons are also prone to being taken down due to copyright infringement. So yes, there’s plenty of good stuff here, and much of it is legal, but proceed at your own risk! Featuring a excellent selection of many of the major sports, Rising Tides does a great job of pushing you towards streams that aren’t likely to suddenly cut out or start buffering at key moments. A lot of sports addons have risen and fallen over the years, but Rising Tides has remained quietly consistent throughout, with a healthy mix of highlights, live sports, HD and SD content. 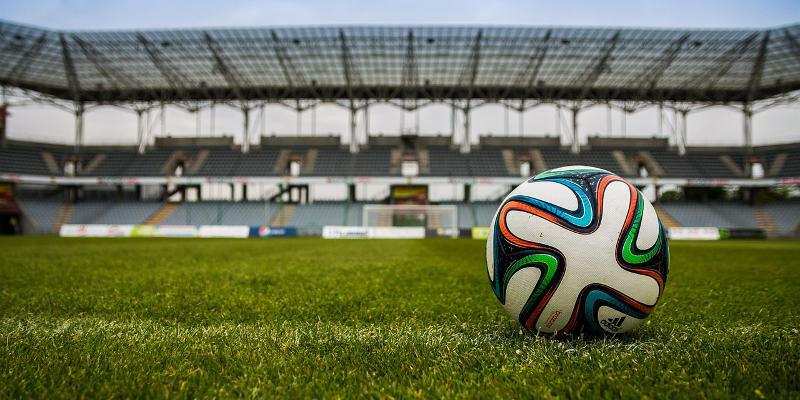 There are hundreds of live sports channels to choose from – ranging from the mainstream biggies in the US and UK, all the way through to European sports channels where you’ll be able to catch up with regional sports such as the Spanish, German and Italian football leagues. One of the main things you risk when using unofficial addons (apart from stumbling onto an illegal stream that can get you in trouble) is the stream not working. 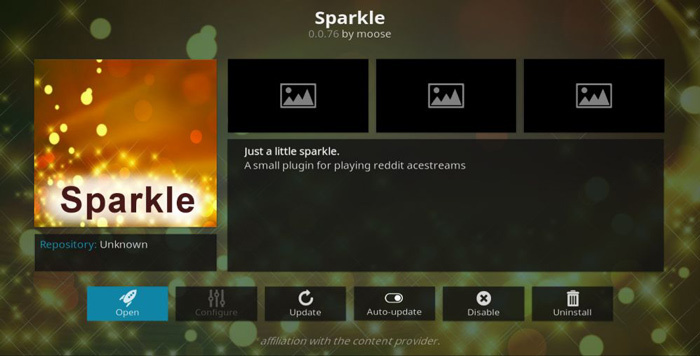 Addons tend to come and go quite quickly, and what’s a great add-on overflowing with streams one week may be barren the next because those streams are no longer available. That’s why Sparkle is great. Instead of streaming from all kinds of obscure sources, it scrapes Reddit Acestreams for streams instead, which is almost universally agreed to be the most reliable place to get high-quality sports streams from all over the world. Sure, there’ll be a few bad eggs in there, but on balance it’s probably the way to go. 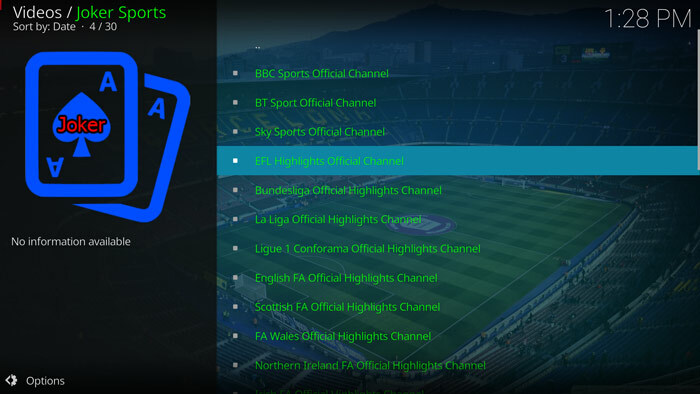 In the Maverick repo, you can find this excellent add-on featuring streams of all the major football (soccer) channels, including BT Sports and Sky Sports, as well as various other football live streams from all over Europe. You can just go into the ‘Kick Off Times/Live Sports’ category and have a browse there to see which matches are starting soon, then just click straight on through to them. If you want to catch up on highlights/other clips from various sports channels around the world, you can also do that by going to the Official Highlights Channel category. You will of course, need to be mindful that you do actually have the rights to watch the channels in question if they’re subscription-based. It will pain every boxing fan to hear that MMA (UFC, specifically) is very much taking over. The upstart art of cage-fighting is seismically popular, and more and more people want to watch it online. Well, the good news is now you can. Whether you want to catch up with highlights or watch the greatest events like the Contender Series, Ultimate Fighter series or Fight Night live, you can thanks to this add-on dedicated to all things MMA. A good transatlantic selection of content makes Sportie a wide-reaching add-on. It specializes in Soccer and Rugby, though you can also catch a fair bit of NFL here too. Streams vary in quality, but look hard enough and you’ll find that perfect HD one that you need. You can find live Premier League coverage here too, so if you’re in a country that isn’t showing the Premier League, then you can tune in here to find streams from all over the world – such as the BBC’s coverage, which you can also find on iPlayer. Cord-cutters know the struggle of watching sports. A lot of networks don’t broadcast to the Internet that well, and when they do, it’s usually pretty complicated to get it all in one place. That’s why these Kodi sports add-ons are so great. Though they might be iffy, and the streams might not be perfect, they get the job done and allow people who don’t watch cable or network television to keep up with their favorite teams. This article was updated in March 2019. Brand new to all this. Just got a box preloaded with the latest kodi. I really want to watch Chicago Sports. I will download the nbcsn, but do I need a VPN for this, or am I safe without one? I only watch the live golf on Golf Channel. I’m finding those broadcasts in the Sports Devil addon. Click on Sports Tv; then iLive.toSports. A list will appear of various live sports events. Scroll to look for golf. Click and it will eventually load. This works only if the event is being broadcast when you log in. I watched NFL with NFLSKY and I think they have the best option to watch regular season too.